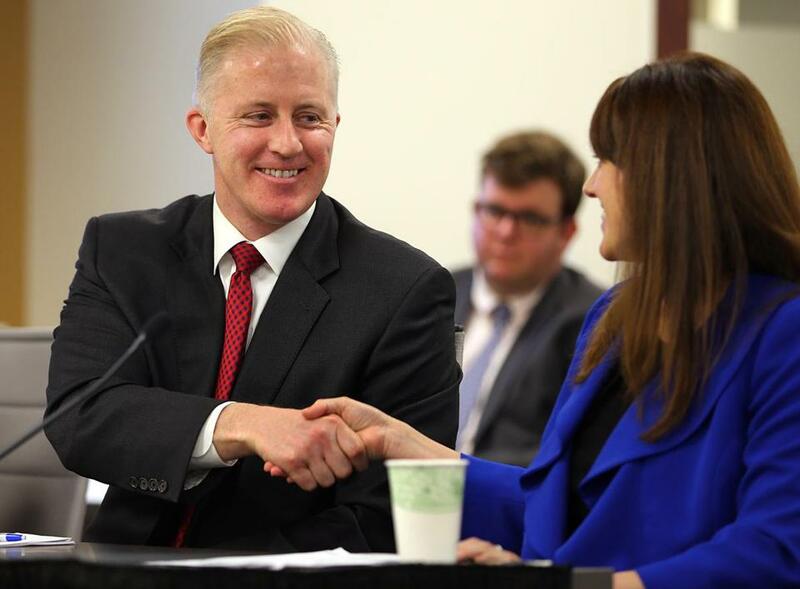 Eugene O’Flaherty, counsel for the City of Boston, shook hands with Jacqui Krum, senior vice president and general counsel of Wynn Resorts, after the state Gaming Commission endorsed Thursday a breathrough agreement between city officials and the casino company over a planned Everett casino. The state Gaming Commission approved a breakthrough agreement Thursday between Boston officials and Wynn Resorts over a $1.7 billion casino planned for Everett, ending months of animosity between the two sides. Eugene O’Flaherty, Boston’s top lawyer, had waged a protracted legal battle against Wynn Resorts since 2014, when the gambling commission awarded the coveted Greater Boston casino license to Wynn over a rival casino bid at Suffolk Downs. In a legal challenge to the Wynn casino, city officials alleged that the gambling commission’s backing was the “product of a corrupt process,” and that the commission deliberately favored Wynn by violating state statutes and gambling regulations. But at a meeting Thursday, O’Flaherty thanked the commission for “all of its hard work” and conveyed Mayor Martin J. Walsh’s “good will” toward the panel. Walsh had taken an unusually personal role in the dispute with casino mogul Steve Wynn. When later pressed by reporters over the city’s allegations of corruption against the commission, O’Flaherty refused to look back. Wynn Resorts said it selected Suffolk Construction because of the company’s pledge to pay attention to detail and meet its timeline. Wynn representatives were likewise determined to move past the dispute. Robert DeSalvio, who heads Wynn’s efforts in Everett, surprised city officials by personally delivering a $1 million check to the city. Wynn had pledged that amount as compensation for increased traffic and other casino impacts, but the city had refused to accept as litigation went forward. “This is a great development,” Gaming Commission member Enrique Zuniga said of the agreement, which appears to remove the last major impediment to a massive casino and hotel complex on the banks of the Mystic River. Under the agreement, reached last week, Walsh promised to end legal efforts to block the casino for $400,000 more in annual payments from Wynn Resorts, bringing the yearly payment to $2 million. The two sides also pledged to improve chronic traffic congestion in Charlestown’s Sullivan Square, a short distance from the planned casino. “To the people of Charlestown who face gridlock, help is on the way,” O’Flaherty said. 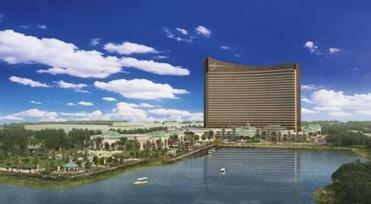 Wynn says the casino will create 4,000 new jobs and hundreds of millions of dollars in new state revenue. The 24-story, curved glass tower is slated to open in late 2018. Sean P. Murphy can be reached at sean.murphy@globe.com. Follow him on Twitter @spmurphyboston.